We stumbled upon the Fisher-Price Space Saver Highchair ($49.99) while shopping diapers and baby wipes at Target. We immediately knew that it was what we needed, even when we were not looking for it. 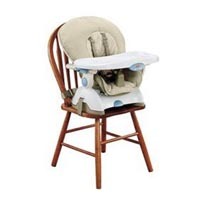 This chair has a high back with 3 reclining positions and 3-5 point restraint, making the chair very sturdy. It also saves space, it's easy to install and clean, and converts to a booster to grow with my baby.